Chinese mobile EC users will be estimated to increase to 353 million people in the end of 2015.
iiMedia recently published the summary report of mobile EC market in China. According to this report, they estimated that the number of mobile EC user will increase to 352 million people in the end of 2015 in China. 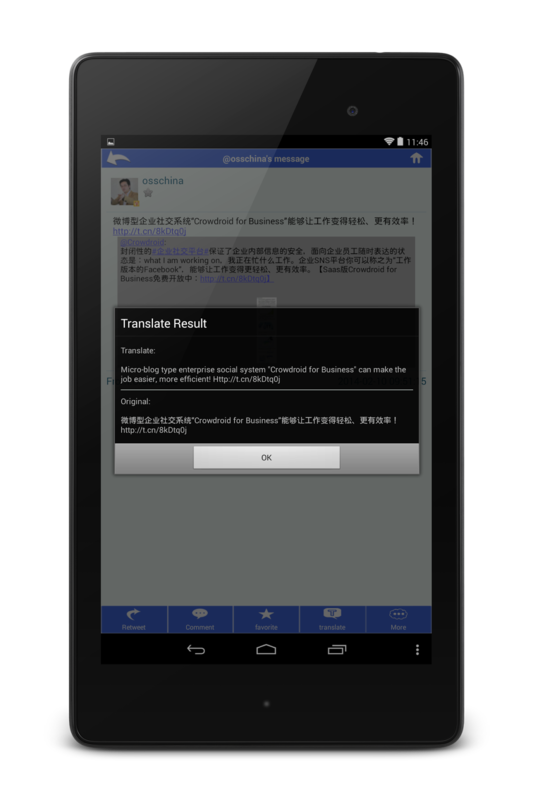 In the end of 2012, the number of mobile EC user was 149 million people. And this was increasing 62.0% compared to 2011. 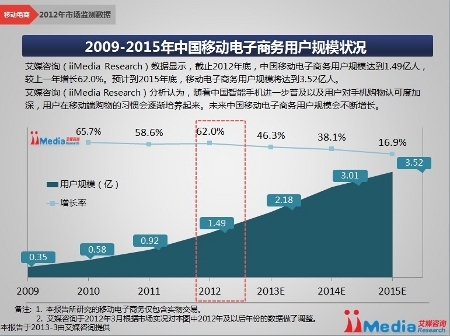 And they estimate that the number of mobile EC users will become over 300 million people in the end of 2014 in China. Next is a graph of the market scale from 2009 to 2015. In 2009, this market scale was 790 million RMB(= 126.08 million USD). But this market was rapidly growing in a few years, this market scale became 47.86 billion RMB(= 7.64 billion USD) in 2012. 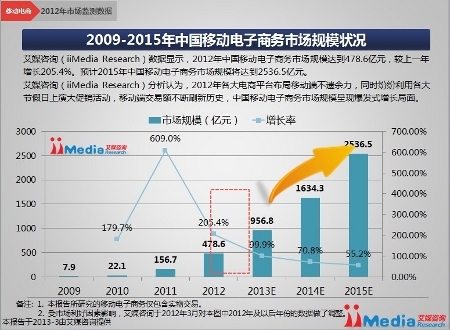 And they also estimate this market scale will be growing to 253.65 billion RMB(= 40.48 billion USD) in 2015. Next is the market share of service provider in mobile EC. 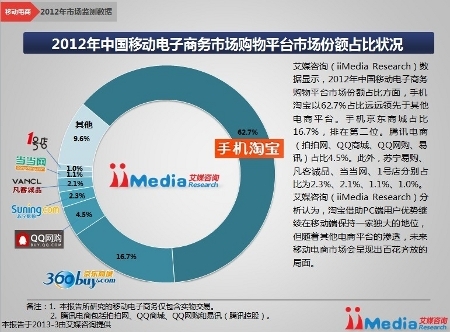 The king of EC market in China, Taobao, have 62.7% market share in 2012. And next position is 360buy.com (now they already changed the name to "JD.com"), and they have 16.7% market share. And third position is the QQbuy that is provided by Tencent, and they have 4.5% market share. Next is the market share by each mobile OS. According to the report by CNNIC, the selling share of Android smartphone in China was 86.2% in 2012. 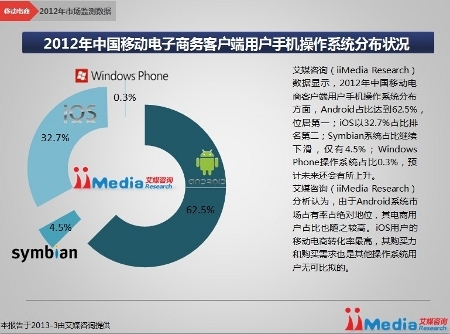 Android smartphone is the most popular device in China, and it also have 62.5% share in this market. And next position is iOS(iPhone/iPad), and they it have 37.7% market share. Last is the usage graph by time zone. The utilization rate start to increase after 19 o'clock, and it peak time is from 23 to 24 o'clock. 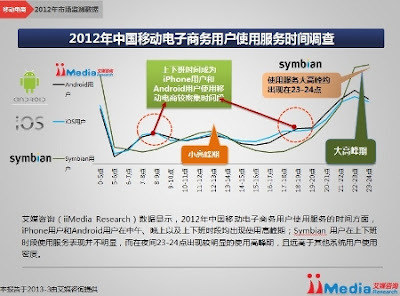 Mobile EC is the hottest market in Chinese mobile internet area, and Sina Weibo and other new faces also joined to this market. We also have to keep watching the movement in this market as before.